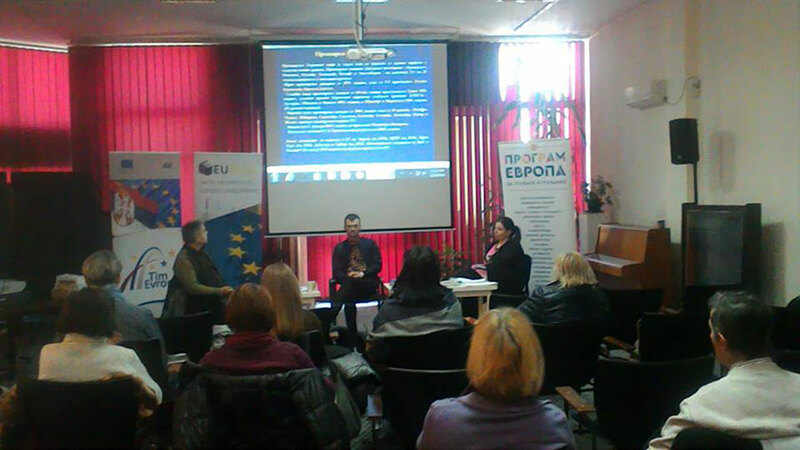 “Local culture and the EU – establishing cooperation“ was the title of a debate held last Thursday, 25 January, at the Public Library in Bor, a member of the EUteka network. At the event, representatives of cultural institutions and CSOs from Bor were brought closer to EU programmes aimed at the development of cultural and media supply. Representatives of local cultural institutions and CSOs had a chance to learn more about two EU programmes: Creative Europe and Еurope for Citizens. Milan Djordjevic, Creative Europe Desk Serbia project manager, brought the citizens of Bor closer to the Creative Europe programme. Funding opportunities offered by the programme were then laid out by the national contact point of the programme Europe for Citizens Sanja Atanaskovic from the Government Office for Cooperation with Civil Society. Djordjevic seized the opportunity to present basic information about the Creative Europe. The audience learned that the Creative Europe has thus far funded over 95 cultural projects in Serbia to the tune of more than EUR4.5 million. “Topics that would certainly appear interesting in terms of competitiveness are industrial cultural heritage of the city as well as its landscape and environment, both seen as the cultural heritage, its socialist architecture, cultural tourism, etc.“ Milan Djordjevic said. The debate was attended by representatives of the Museum of Mining and Metallurgy, a local cultural institution that could introduce the unique cultural heritage of Bor, a mining town, into European cultural scene. Sanja Atanaskovic of the Government Office for Cooperation with Civil Society said that Europe for Citizens programme had two components: European Remembrance and Democratic Engagement and Civic Participation. She also said that the Office she was representing was standing ready to offer support to CSOs should they decide to apply. Milan Stefanovic, a member of Тeam Europe, also addressed the audience by giving them an overview of EU institutions and current phase of the negotiating process. He also briefed them on previous activities of the programme Europe for Citizens in Serbia, with a special emphasis on donations made and assistance provided to eastern Serbia. This was the 33rd public event organised within the project EUteka – The EU at your library.